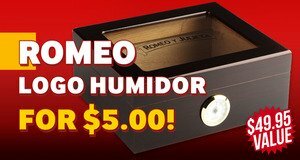 Romeo Logo Humidor Only $5.00 More With Box Purchase! Buy a Box of Romeo y Julieta Crafted by AJ Fernandez, Romeo y Julieta Star Crossed, Romeo y Julieta Star Crossed Dark, and Romeo y Julieta Medallas de Oro cigars, get a Romeo y Julieta Logo Humidor, valued at $49.95, for only $5.00 more! Romeo y Julieta Logo Humidor only $5.00 more with purchase!